A smart to-do list with a terrifying countdown for when it's crunchtime. 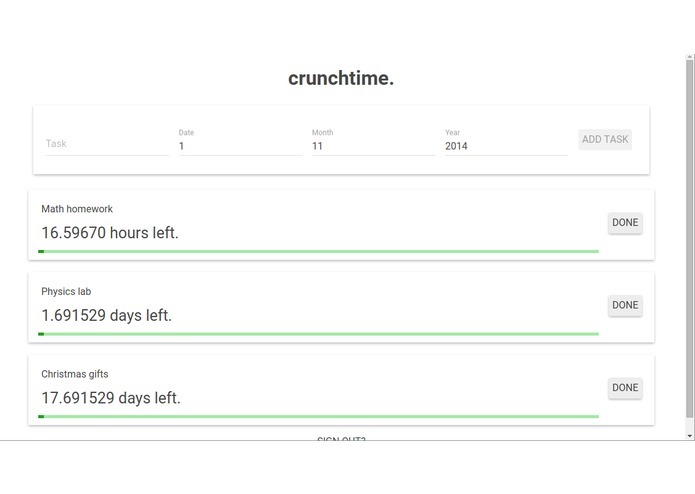 crunchtime is a smart to-do list with a terrifying count-down timer. Getting things done can be tough, especially when the list of things to do is long and you are unmotivated. crunchtime is a to-do list with built-in motivation, in the form of a colourful progress bar displaying how far you've gone and a terrifying countdown timer whose display is indicative of how much time you have left until your deadline. Anyone and everyone who wants, or needs, to finish something now. We're two first-years who graduated in the same high-school class. Procrastination is definitely not a problem for us. Nope. Not at all.